VOSD has signed a contract agreement with the JICA to implement the project “Conducting UDCC Meeting in Greater Faridpur” among the UP Chairmen, Secretaries, Members & other stakeholders like Upazilla govt. officials and administrations to promote bottom up coordination, mass participation, good governance, accountability, human rights, and available resource utilization through developing model Union Parishads. According to Union Parishad Act 2009, the Union Parishad (UP) is mandated to coordinate the activities of all development functionaries working at union level. 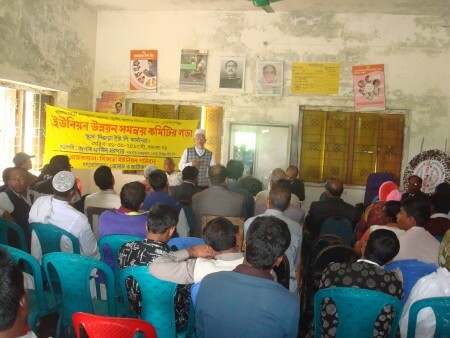 In line with that provision, Bangladesh Rural Development Board supported by JICA has initiated a Union Coordination Committee (UCC) under Participatory Rural Development Project Phase 1 and 2 strengthen the dialogue and coordination among UP functionaries (UP Chairman, Members and Secretary), government and NGO extension workers at the union level and village representatives from different professions. UCC holds the monthly meeting, called Union Coordination Committee Meeting (UCCM), at the Union Parishad Complex (UPC) conference hall with the participation of UP functionaries (UP Chairman as the Chairperson of the committee), field workers of government departments and NGOs, and representatives of villages. In UCCM, government and NGO field workers report the progress of their programs and formulate their work schedule of the following month, and coordinate with village representatives who are the recipients of the services. All the participants in the UCCM discuss extension activities and performance. UCCM is highly appreciated by concerned stakeholders as well as outside observers as “Mini-parliament.” Local Government Division (LGD) of Ministry of Local Government, Rural Development and Cooperative issued a circular to institutionalize the UCC on 13th February 2011 as Union Development Coordination Committee (UDCC). Lessons learnt from the existing good practices suggest that inputs from the target beneficiaries as well as regular and close communications among stakeholders are essential for the successful implementation of any development activities and the sustainable operations and maintenance of the water supply facilities. National Water Policy also gives stress on the management of national water resources by the community concerned along with UPs involving public and private sectors, communities and individuals with proper coordination. The Union Development Coordination Committee (UDCC) initiated by BRDB/JICA and institutionalized by LGD Circular is a platform to coordinate all the development activities in the Unions. All the government staffs at Upazila, who are mainly responsible to implement sectoral programs at rural area, are the members of the UDCC. Village representative as well as the member of community based organization especially WMCA representatives can be the member of the committee. Therefore, it is expected that CBOs, NGOs, WMCA, and UPs would utilize the UDCC to ensure the successful implementation of development project and ensure sustainable operations and maintenance.